There is a new, beta, version of Dropbox has been launched that can now import pictures directly from your camera, phone, and external drives, like USB flash drives. To encourage users to test this new feature, Dropbox will offer your 500MB extra space to your current Dropbox account for every 500MB images you import from your camera. Here’s how it works. First, download the beta version of Dropbox (link is provided below) and install it to your PC, Mac, or Linux. Then, plug in an external drive, like a flash drive, phone, or a camera. 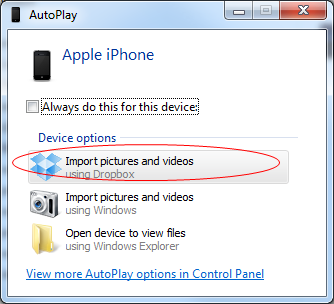 When the autoplay appears, click the item that says “Import Pictures and Videos” with the Dropbox logo on its side. Wait for it to import and you are done! If the autoplay doesn’t appear, you can go to my computer, right click the external device, and then click autoplay. Once imported, Dropbox will slowly upload all the imported pictures to the cloud. Every time 500MB is uploaded, you will gain 500MB. It can take a long time, but just let it sit and do its thing for a couple of days, and it will be worth it! You can, of course, keep using your computer, shut it down, put it to sleep, or what not. Every time you gain 500MB, you will see a notification saying so! Remember, this adds 5GB extra space to whatever space you currently have. I am in the process of importing my pictures and videos, and I raised my 2GB cap to 6GB so far! The link below takes you to the official forum thread that has the download link. There are links for Windows, Mac, and Linux versions. Enjoy! Previous Previous post: Do You Want to Be a High Tech Entrepreneur?